Hmm. I thought that was a pretty good product idea. Something to keep the iPad safe from water and let you take it with you to an area you know it will be constantly “splashed” on. 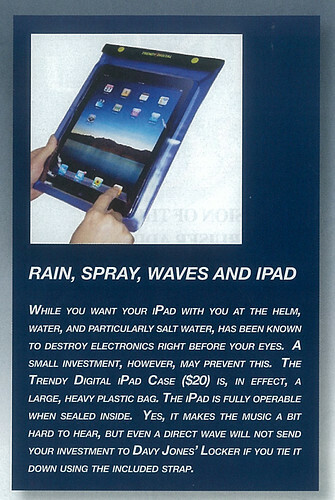 But as soon as I read the “large, heavy plastic bag” part of the ad, I wondered if the iPad would fit in a Ziploc bag, and would an iPad be safe from water splashes in a giant Ziploc bag? 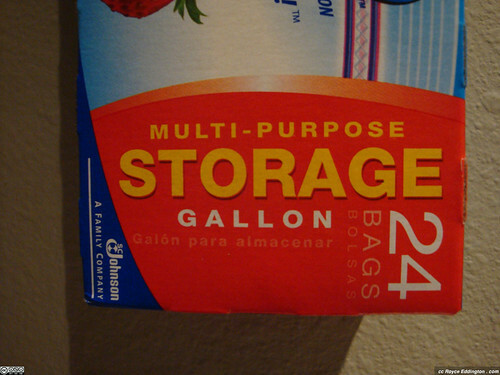 …and the one gallon size at that! I was a little worried about the fit, but after opening the Ziploc bag, the iPad (with the Apple case still attached) dropped right in and had plenty of space left! 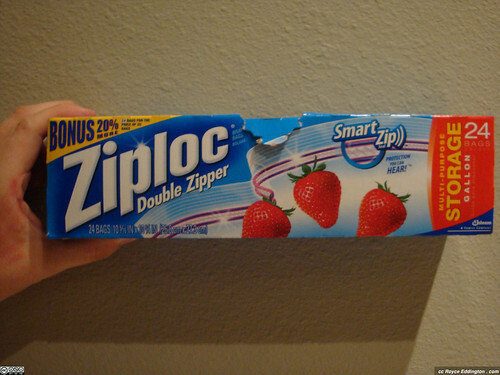 I flipped the iPad around so the Ziploc logo would be on the other side of the screen, and then sealed the top of the bag. 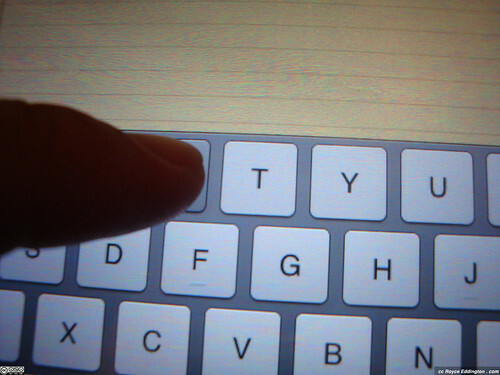 The fit wasn’t snug, and there was a lot of Ziploc left on the left and right sides of the iPad, but I was able to swipe to unlock the iPad, and all the applications I launched responded to my touch just fine. 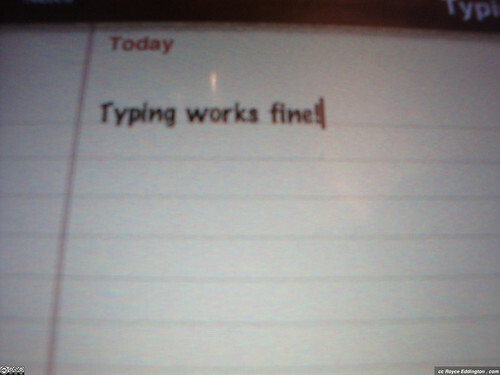 Typing wasn’t any problem either! 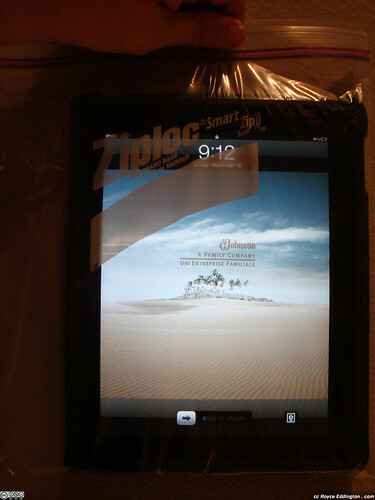 The iPad registered every single touch just fine through the Ziploc, whether the bag was pulled tight or left loose. So far, so good! 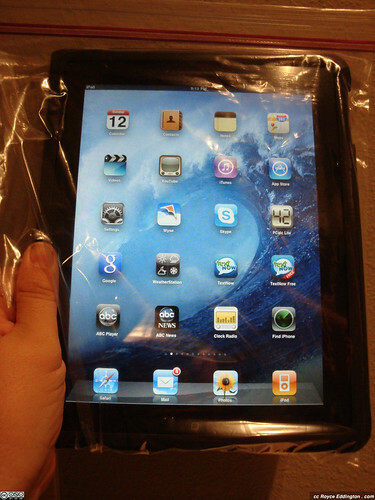 The iPad still functions when sealed in a one gallon Ziploc bag. Now for the “splash” part! After triple checking I had sealed the top of the Ziploc bag, I decided to go all out, and put the iPad in the middle of the sink and moved it slowly in every possible direction with the faucet on full blast. I did this for 5 minutes. 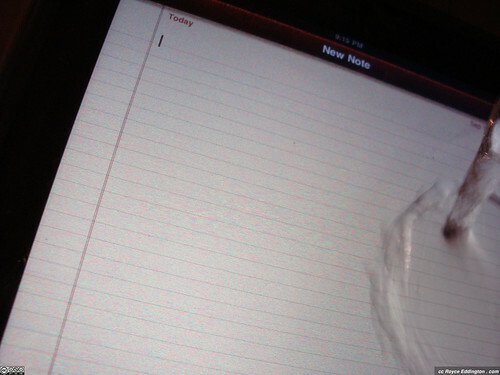 The Ziploc held on tight to the iPad! After moving it around and seeing no damage, I decided to leave the iPad flat in the sink and let the water hit it straight on. 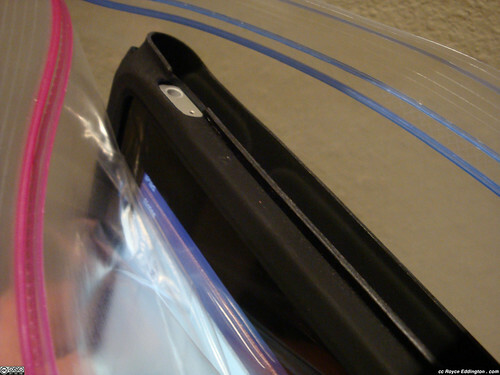 (I did incline the iPad about 10 degrees so that the water would drain and the Ziploc/iPad would not become submerged.) I did this for one minute. Little did I know this whole time that the water faucet was trying to communicate with me! I stopped the water after a minute, pulled the iPad out of the sink, dried the exterior of the Ziploc, and opened the top. Dry as a bone! Wonderful! It worked! 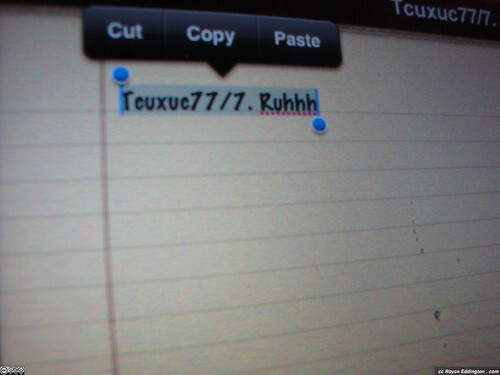 And just to make sure the iPad typing was OK, I pressed a few keys to see what would happen. Success! No problems at all! I figure if the Ziploc bag can withstand a full-blast from a sink’s water spigot, then it shouldn’t have any problems keeping the iPad safe in light spray or the occasional “hi there!” ocean wave smack. I wouldn’t want to subject the Ziploc bag to too much stress, though, as it is only held closed by that little click-seal on top. I wasn’t brave enough to completely submerge the Ziploc with the iPad in it either, so I have no idea if this would keep the iPad safe in a 100% underwater environment. Also worth mentioning (again) is that the Ziploc bag allows sufficient water pressure to register as input. 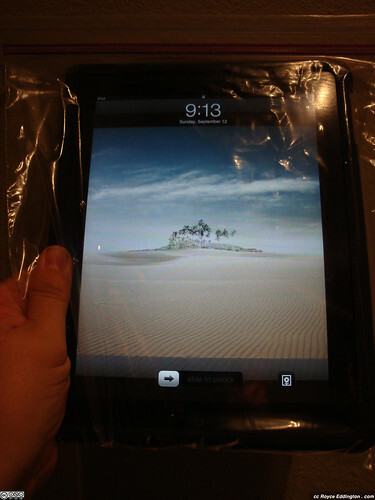 But overall, it’s good to know that a one gallon Ziploc bag (retail price about .12 cents each), does seem to work as an emergency waterproof iPad case! 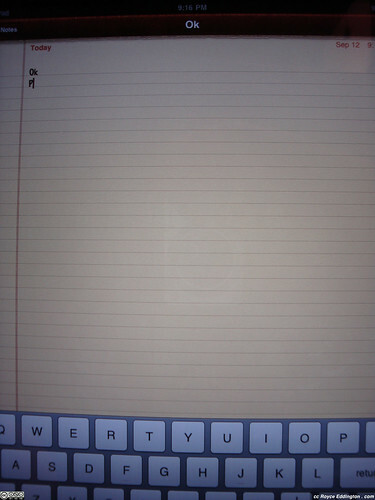 This entry was posted in iPad, Photos, Tech! by Royce. Bookmark the permalink. As a website possessor I believe the content material here is rattling magnificent , appreciate it for your hard work. You should keep it up forever! Best of luck. Love the post. Hope you don’t mind that I link to it!